The ever bustling Barcelona is atop many a list of destinations known to host the best festivals and celebrations in Europe, and New Year’s Eve is no exception! From theme parties at some of Barcelona’s chicest clubs to a memorable light show at the Montjuïc Magic Fountain, plus much, much more, Barcelona makes the perfect place to enjoy New Year’s Eve in 2017! What’s more, those who choose to rent one of the many Ramblas apartments in Barcelona will be close to all of the action taking place in the city, while having a safe and welcoming place to call home at the end of the night. 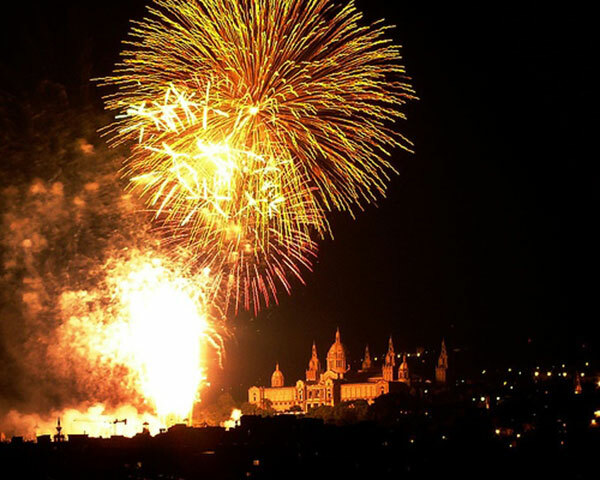 Read on for some top tips on how to make the most of your New Year’s Eve in Barcelona! Torre Agbar: This famous Barcelona landmark brightens up the sky with a colorful light show for all the family. 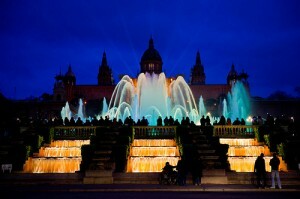 Plaça Catalunya: Head to the center of the city where thousands will gather to ring in the New Year. Plaça Catalunya will be packed with locals and visitors getting ready to welcome 2018. What’s more, Las Ramblas is just a few steps away, meaning that your options for post-countdown parties include plenty of bars, pubs and clubs where you can dance the night away! Sala Razzmatazz: This club/dance hall will be hosting a fantastic New Year’s Eve party where you can enjoy a spectacular fiesta with everything from champagne to grapes, and grab a t-shirt to commemorate the night. Check out the Razzmatazz website for more info. Magic Fountain of Montjuïc: A perfect idea for families visiting Barcelona is the Font Màgica pyromusical show, near Plaça Espanya. Great music, colorful lights and dancing water all combine to make for a truly unforgettable way to greet 2018! Poble Espanyol: If you are in search of live concerts to celebrate the New Year, then be sure to head to Poble Espanyol at Montjuïc! This Spanish village, which is also an open-air museum, turns into a huge university party that spreads across 3 indoor venues. Barcelona Beach Parties: The summer may be long gone but Barcelona’s beaches are another great option for your New Year’s Eve. The Catalan capital’s favorable weather allows party-goers to bid farewell to 2017 by the shore at one of the many bars, clubs and restaurants that open up onto the sand. Don’t miss the fireworks over the Mediterranean, too. Tablao de Carmen: Why not opt for a traditional night out by heading to one of Barcelona’s top flamenco clubs? A truly Spanish New Year’s Eve awaits you as you enjoy dinner and a fantastic show while welcoming 2018. It goes without saying that the party doesn’t stop after midnight, so be sure to make your way to the many clubs at Port Olímpic, where Barcelona’s beautiful people gather and celebrate till the wee hours of the morning. For those in search of a chic backdrop, head to Shôko for a full night event, starting from 50€ for the early bird club entry or you can go FOR A Gala performance with a meal for 250€. You can also choose one of the many other clubs in Barcelona like Pacha and Catwalk hosting special NYE events. With so many choices, your New Year’s Eve 2017 in Barcelona is sure to be an unforgettable one. This entry was posted in Activities, Bars & Nightlife, Events, Home and tagged barcelona activities, barcelona attractions, Barcelona culture, barcelona events, Barcelona festival, barcelona festivals, Barcelona food, barcelona food and drink, barcelona nightlife, barcelona tourist guide, new years eve in barcelona, tourism in barcelona, travelling around barcelona, visiting barcelona. Bookmark the permalink.